Successfully Added HK Warehouse Gretel GT6000 Android Smartphone - Quad-Core CPU, 2GB RAM, Android 7.0, Dual-Rear Cam, 6000mAh, 4G (Black) to your Shopping Cart. The Gretel GT6000 Android phone packs a whopping 6000mAh battery. With this cell, it delivers up to a mind blowing 16 hours of continuous usage time. Thanks to this, you’ll be able to use your Android smartphone for multiple days without needing to recharge. From now on, you’ll never have to be bored again. This Android phone will let you enjoy a media filled day without ever needing to worry about running out of juice. With its Android 7.0 operating system, you are sure to enjoy the latest software features and mobile entertainment. No matter the type of smartphone user you are, the Gretel GT6000 is sure to meet your mobile demands. On its 5.5-Inch LCD display, your phone brings forth crisp HD visuals. By supporting the latest IPS technology, it will treat you to vivid colors and great details. This means that you’ll be able to enjoy your films and series to their absolute most. With this Android phone at your side, you’ll always be able to enjoy a cinematic experience straight from the palm of your hand. 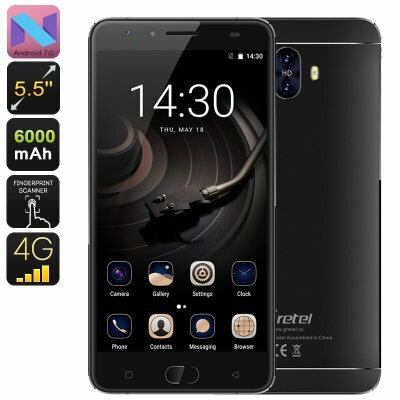 Thanks to its sophisticated Quad-Core CPU and 2GB RAM, your mobile phone is sure to handle all basic software features out there. In terms of connectivity, the Gretel GT6000 surely stands out from other cheap Android phones. With its 4G support and Dual-IMEI numbers, this Android smartphone is sure to keep you connected throughout the day. From now on, you’ll always be within reach and are able to browse the web wherever you are. This lets you stream movies and download files from the Play Store at any given moment. With 16GB of internal storage and a 32GB SD card slot, there will be plenty of space to store all your files. Your mobile phone furthermore comes with a 13MP Dual-Rear camera that lets you snap breathtaking images. From now on, not a single special moment in life will pass by without you snapping the perfect photo. The Gretel GT6000 Android phone comes with a 12 months warranty, brought to you by the leader in electronic devices as well as wholesale Smartphones..
ordered my product on august 18th, they said between 3-6 days, once the package is delivered, with all of it contents inside, then I will give an detail review. thanks.